Well, if you ask for some good speaker suggestions to use with a home theater or big stereo system, obviously you’re gonna hear some pricey names. It needs great performance to bring the best out of a system and that’s why cheap simple speakers aren’t usually recommended. However, in case you’re tight on the budget and need to make some adjustments, some budget speakers are available indeed. Yes, we’re talking about the $200 bookshelf speakers. Only these bookshelf speakers are capable of bringing the same quality performance like an expensive speaker, with slight modifications and in a cheaper rate. And for this, we appreciate your wise decision. Now, it’s our job to guide you to the best speaker. For your convenience, we researched and picked top ten bookshelf speakers under 200 dollars. These bookshelf speakers have been reviewed elaborately to give you a proper sight of the features. Before you head to “The best bookshelf speakers under 200 dollars” reviews, we thought it’d be great if you check the list of things THAT SHOULD NOT BE DONE WITH A BOOKSHELF SPEAKER. The first candidate of our bookshelf speakers under 200 dollars list is Edifier R1280T Powered Bookshelf Speaker. Retro fashion combined with modern technology, can you feel the edginess? 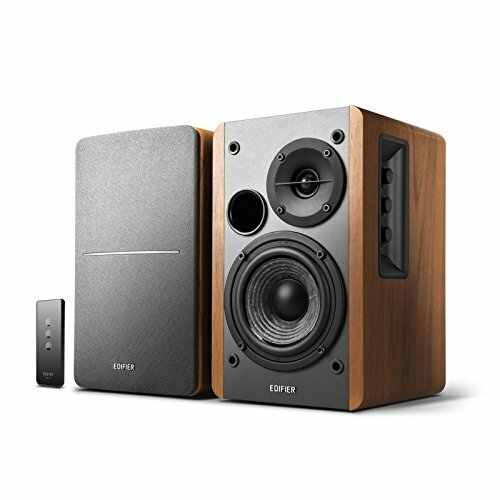 Edifier R1280T Powered Bookshelf Speakers come in a pair. One is an active speaker and the other one is a passive speaker. A regular speaker wire is used for connecting them. Each speaker features a 13 mm silk dome tweeter and a 4 inch full range unit. The full range unit and the tweeter work together to reproduce spontaneous treble and bass. There are two inputs for RCA and AUX cable connections included on the active speaker’s back panel. You can use them for both RCA to AUX and RCA to RCA connections. The inputs are built to connect 3.5 mm headphone jacks. 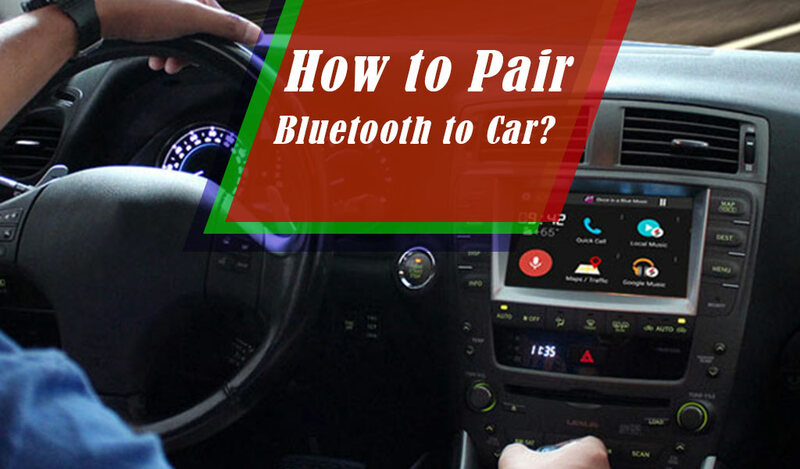 The AUX port lets you connect the speaker to two devices at once, and it can be done without any requirement of switching or plugging. The active speaker includes built-in tone control at one side. This tone control allows you to adjust the treble and bass efficiency from +6 dB to -6 dB. 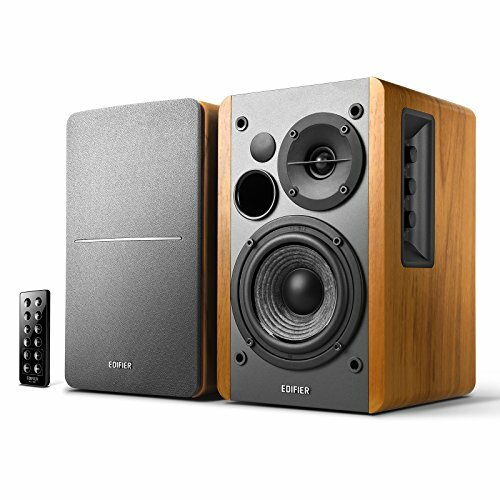 Edifier R1280T Powered Bookshelf Speaker comes with a remote control as well. This remote control is featured for controlling volume and muting audio from a distance. To give the speakers classy vintage attire, high-quality MDF wood has been used in cabinet construction. While MDF wood fights against annoying resonance and works to replace all the problems that could be caused by actual wooden structure, wood effect vinyl finish volunteers to bring the appealing retro look. The speakers include removable mesh grilles. Recommended full range voltage input is 100-240V. An on/off switch is included. Edifier R1280T Powered Bookshelf Speaker comes with the fabulous combination of retro style and effective modern techs which makes it the ultimate winning deal. Such deal under 200! Do you still need to think? Active and passive speakers come together. 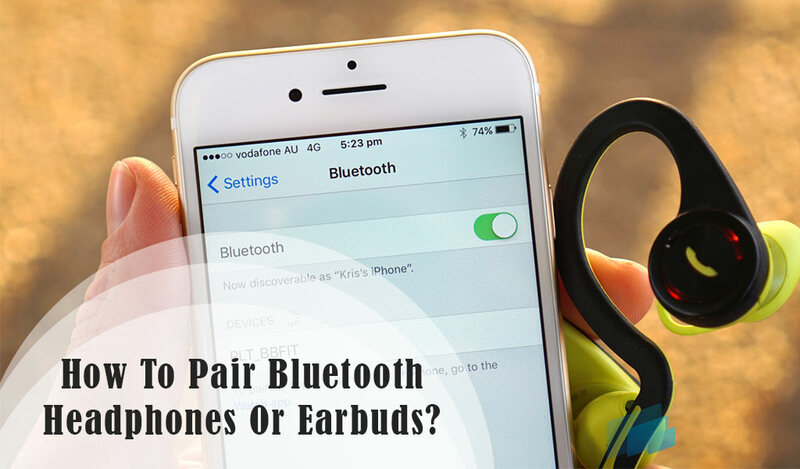 Two devices can be connected to the speaker at the same time. You can control sound with the included remote control from a distance. Great audio service for TV, console and PC. Many customers are not satisfied with enclosure construction. Not a wise choice for loud music. Sony – a name that is admired all around the world for great products and it’s been going on for years. So, there’s no doubt, Sony SSCS5 3-Driver Bookshelf Speaker is definitely gonna worth it. Sony Sony SSCS5 3-Driver Bookshelf Speaker is built to bring the addictive, profound, high quality audio performance in a simple attire. This 3-way speaker features a 3/4 inch wide dispersion super tweeter. The tweeter is professionally engineered to deliver tremendous vocal. With 6 ohm impedance and up to 50kHz high frequency audio response, it reproduces ultra-responsive treble. This driver has also made possible Immersive sound staging and wide directionality. 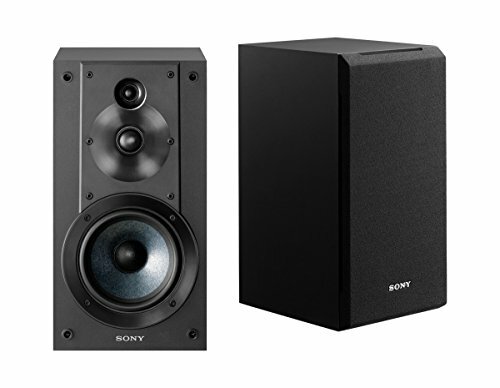 For bass delivery, Sony SSCS5 3-Driver Bookshelf Speaker features two types of components. 5-1/4″ foamed-mica cellular reinforced woofer is included alongside the tweeter. The woofer diaphragm consists of two layers – the bottom layer lifts low weight to process powerful bass and the top layer combines the bass with other ends to produce quality sound. On the other hand, a bass reflex system is inserted that boosts the bass quality. Like a perfect seasoning on a dish, a crossover network is established with optimized crossover componentry. The crossover network works devotedly to deliver sound while curbing signal loss and volunteering for vibration isolation. Yes, considering the whole mechanism, it can be said, Sony SSCS5 3-Driver Bookshelf Speaker is not less than a knight in shining armor. Tweeter and woofer are brilliantly engineered. Less signal loss due to high quality crossover network establishment. Cabinet construction needs more attention. Mid-range is a little weak even though it’s a 3-way speaker. Best speakers under 200 dollars? 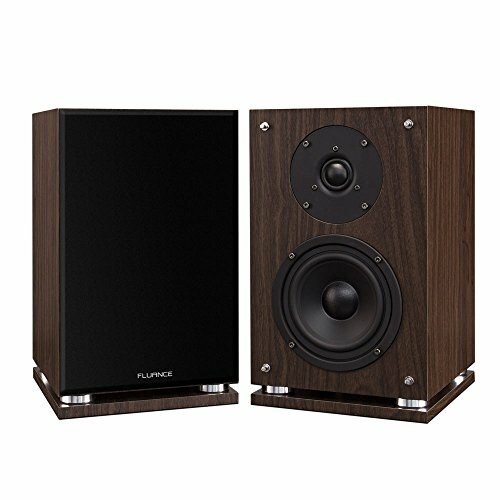 You should definitely give Fluance SX6W High Definition Two-Way Bookshelf Loudspeaker a try. This two-way speaker works with 30-100 watts power handling. It covers frequency response range of 50Hz-20kHz. Follows 8 ohms impedance and 89±3db sensitivity. 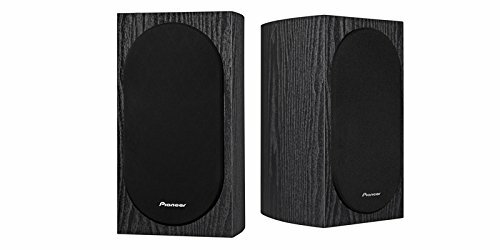 Fluance SX6W High Definition Two-Way Bookshelf Loudspeaker features a 1 inch soft dome ferrofluid cooled tweeter and a 5 inch polymer treated woofer. The woofer comes with butyl rubber surround. The tweeter is constructed with cooled ferrofluid to ensure longevity. The butyl rubber surround of the woofer makes it compact and reduces distortion. For bass boost, a tuned bass port is also included. The bass port controls low end notes and sound efficiency. A crossover network is established following Butterworth design that controls equalization. Magnetic shield is included to protect the speaker’s audio mechanism. The cabinet is constructed with MDF wood. MDF wood is beneficial for resonance reduction. Includes low diffraction flush fit front grilles, these grilles are removable and featured for the purpose of spacious imaging. Vinyl veneer woodgrain finish gives the speaker a divine look that works great with all sorts of home decor. The speaker features 5-way gold-plated binding post terminals. Banana plug and speaker wire are used for speaker connectivity. An 18 gauge internal lead wire is also included that minimizes signal degradation. $500 worth mechanism in $200 speaker. So what do you say, yay or nay? No possibility of the woofer or the tweeter getting damaged quickly due to use of compact materials. MDF wood cabinet reduces annoying resonance for clear audio. The design looks good with home décor. Video devices can’t affect sound quality since it’s magnetically shielded. Perfect front speaker for a home theater. Can be shipped only to a few countries. Use of the highest voltage can be threatening for the drivers. If you’re an audiophile, you will understand what kind of magic is bound to happen when it’s a speaker from the famous Pioneer company and is especially designed by the most acclaimed speaker engineer Andrew Jones. Yes, we’re talking about Pioneer SP-BS22-LR Bookshelf Loudspeaker. Pioneer SP-BS22-LR Bookshelf Loudspeaker is a 2-way speaker. It works with 80 watt power handling. This speaker features a 1 inch high efficiency soft dome tweeter and a 4 inch structured surface woofer. The tweeter is equipped for the smoothest high end note delivery, the frequency remains distortion-free even at the highest volume. To boost bass response, vented pole piece and oversized magnets have been included in the woofer. Six element complex crossover network is formed inside. This crossover network combines the frequencies coming from the tweeter and the woofer, and produce smoothly blended spontaneous audio. Pioneer SP-BS22-LR Bookshelf Loudspeaker is constructed differently than genuine bookshelf speakers. It followed a curved cabinet design for internal standing sound waves reduction. Moreover, this unique construction makes the cabinet more durable and a unique addition for your home decor. Removable grilles are included for the speaker’s protection. Andrew Jones is admired all around the world for his fascinating contribution towards effective speaker engineering. And all the features above are also a great reflection of his genius. An Andrew John creation under 200 dollars, definitely it’s your lucky day! Delivers improved and more accurate bass than older models. Produces great treble even at the highest volume. The cabinet is constructed uniquely to solve the problem of standing sound waves. High quality crossover network does an excellent job of frequency blending. Wire connection quality needs some improvement. Mid-range is weak since the crossover network is more focused on treble and bass. Well, an American list of the best bookshelf speakers under 200 dollars can’t be considered complete without a Klipsch being mentioned. 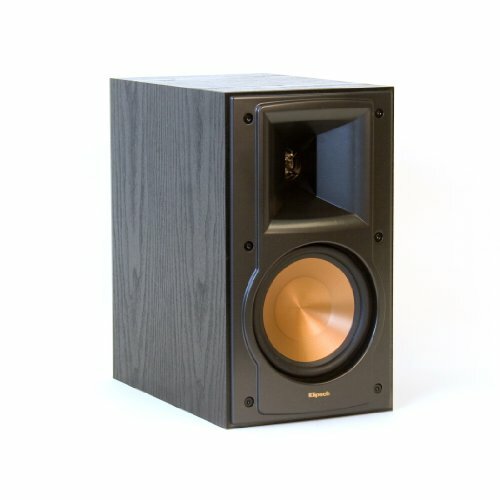 Klipsch R-14M Reference Speaker is a 2-way speaker. It works with 50 watts of continuous and 200 watts of peak power. Covers frequency response range of 64Hz-24kHz. Follows 8 ohms impedance and 90 dB sensitivity. The speaker features a 1-inch aluminum Linear Travel Suspension horn-loaded tweeter and a 4-inch copper-spun IMG woofer. Tractrix horn technology has been used in the tweeter for wide sound dispersion privilege. The linear travel suspension reduces distortion. The copper-spun woofer is built with injection molded graphite which makes the driver rigid to handle powerful low-end notes. Its cabinet is constructed of MDF wood and feature a stunning polymer veneer finish on the outside. Removable cloth grille is also included. Klipsch R-14M Reference Monitor Speaker comes with 5-way binding posts. These posts are suitable for pin-connectors, bare wire and banana plugs. A port is included on the speaker’s back panel for turbulence control. It comes with rubber feet for shelf or top placement. You can also mount it on the wall, keyhole slots are included. Klipsch is an admired name all over America. They’ve been producing excellent audio products for decades and you can always count on them for quality. Klipsch R-14M Reference Speaker holds all the attributes that are enough to define a potential speaker and it’s certainly one of the perfect bookshelf speakers under 200 dollars. Bass response can’t damage the woofer because of its rigid structure. Turbulence and diffraction are reduced. Delivers accurate treble and bass due to quality cabinet and driver construction. Frequencies can get mixed up since there’s no crossover design established. Upgrades are always better, aren’t they? Edifier has always devoted itself to push the boundaries and bring revolutionary changes to its products, and Edifier speakers are always appreciated for this sole quality. More than one Edifier is always welcomed in the list. Edifier R1280DB Powered Bluetooth Bookshelf Speaker is more like an upgrade rather than an original creation. It’s one of those classic best-selling Edifier speakers that had been modified recently with the latest speaker technology for a high-quality audio response. The speaker features 13 mm silk dome tweeter for treble and 4-inch bass driver for low-end frequency. In this improved version, wireless technology has been equipped. Edifier R1280DB Powered Bluetooth Bookshelf Speaker comes with Bluetooth connectivity option, which allows you to play audio files from a Bluetooth enabled device and for that, wired connection is not required at all! For wired connection, it already had RCA input option. Coaxial and optical inputs are new addition to expand connection choices. On the back panel of the powered speaker, there are dial knobs for volume control and equalization. A redesigned remote control is also included to regulate the speaker from distance. Edifier R1280DB Powered Bluetooth Bookshelf Speaker, with no doubt, has tremendous features for great experience. And the black wood finish on the outside gives it a stunning look that suits every electronic system. Perhaps this is the one for you? Perfect for any modern system since it’s an upgraded piece. Wired connection options have been expanded by adding optical and coaxial inputs. Songs can be played wirelessly from Bluetooth enabled devices. You can control the speaker even from a distance with the remote control. The sound is good for television or computer, but not for loud music or big events. You have to connect it to an amplifier for the best result. Can be shipped to only a few countries. The main purpose of making the best speakers list was to suggest you some 200 dollar worth speakers that work great with any stereo system/home theater and can be a great invest for your room. In this regard, seems like Cerwin Vega SL5M 2-Way Bookshelf Speaker meets our criteria perfectly. 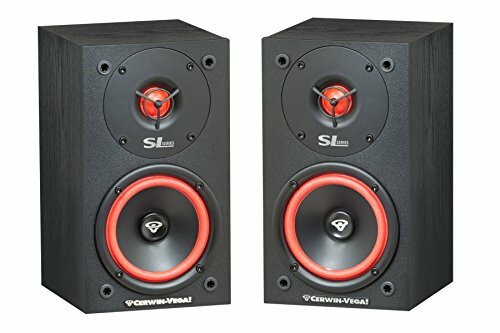 Cerwin Vega SL5M 2-Way Bookshelf Speaker works with 125 watts peak power handling. It covers frequency response range of 58Hz-26kHz. Follows 8 ohms impedance and 85dB peak sensitivity. It features a 1 inch soft dome tweeter for treble and a 5 1/4 inch driver for bass. The driver focus on the intense bass punch you want to experience and that’s the specialty of this speaker. It’s not only the drivers that make a speaker the best speaker, the construction matters as well. Cerwin Vega SL5M 2-Way Bookshelf Speaker comes with a bass reflex cabinet. The cabinet construction has been proved greatly effective for extended low end frequency’s quality improvement. The speaker’s black attire works great with all stereo system designs. It features grille for extra protection, the grille is removable. 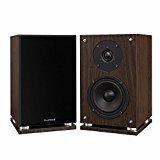 Cerwin Vega SL5M 2-Way Bookshelf Speaker is the perfect speaker in so many aspects. How? It’s equipped with good drivers and the construction is also beneficial for bass response. Briefly speaking, whether as a single bookshelf speaker or as a part of a big system, Cerwin Vega SL5M 2-Way Bookshelf Speaker is always gonna be a beneficial investment. The cabinet construction boosts sound quality. You can use it as a single speaker or connect to a stereo system. Wire connection options need to be expanded. Treble can get distorted sometimes. We’ve made sure to fill our list of the great bookshelf speakers under 200 dollars with well-known brand speakers. Why? Because these brands are always up to new modifications to stand tall in the competition and this is the reason why their products never fail to impress. You’re an audiophile and never heard of Yamaha, that’s impossible. Yamaha has built a rich profile with a large number of quality audio goods over the decades. 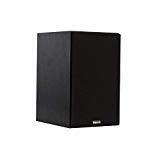 Yamaha NS-B310BL Full-Range Acoustic Suspension Bookshelf Speaker works with nominal input power of 40 watts and maximum input power of 120 watts. It follows 6 ohms impedance and 87 dB sensitivity. This speaker comes with a great arrangement for bass. It features dual 3-1/8 inch aluminum cone woofer. The woofer diaphragm is built of rigid, lightweight aluminum because aluminum cones are proficient in giving fast frequency response. This material is also very effective for high resolution low end sound. No magnetic shield is included. So the sound extraction for more accurate sound staging is very easy with large magnet application. The speaker’s cabinet is also precision shaped for standing wave reduction and rich bass delivery. Front panels are constructed with sandblasted aluminum. This speaker is available in three finish. 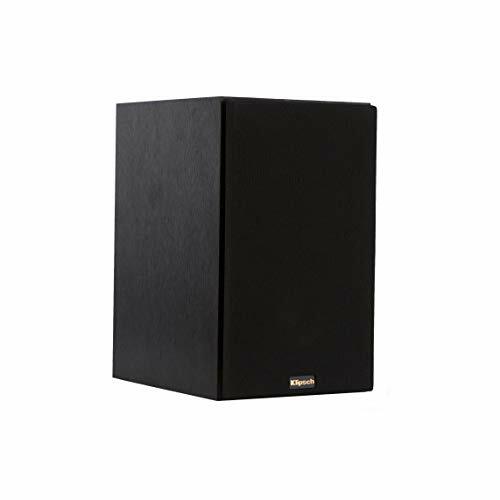 Yamaha NS-B310BL Full-Range Acoustic Suspension Bookshelf Speaker can be mounted on the wall. The main purpose of installing a loudspeaker is always one – we want profound bass response. In attire, in construction and in driver arrangement, Yamaha NS-B310BL Full-Range Acoustic Suspension Bookshelf Speaker is all about it. You should definitely go for this speaker if rich bass is your top priority. Delivers accurate sounding clear bass. Compact and sturdy choice of material. Comes with three different finish choices to suit your home/system décor. The treble quality has been kinda overlooked. Can be problematic for video devices since it’s not magnetic shielded. You can’t use it as a single speaker since it works more like a subwoofer. Definitive Technology SM55 Bookshelf Speaker may not seem much, but wait until you see the features. Definitive Technology SM55 Bookshelf Speaker is a full-range speaker. It works with 20-225 watts of amplifier power. Covers frequency response range of 32Hz-30kHz. Follows 8 ohms impedance and 90 dB sensitivity. The speaker features a 1 inch aluminum dome tweeter and a 6.5 inch second generation BDSS cast-aluminum basket mid-range driver. The heat-treatment and later ceramic-coating helps the tweeter produce high quality, smooth treble. 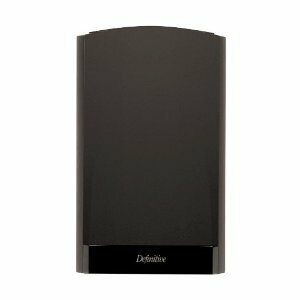 Definitive’s patented Balanced Double Surround System (BDSS) technology has been applied in mid-range driver’s cone construction for detailed and divinely textured sound. For off-axis frequency response, Linear Response Waveguide is used. It also works for clear and detailed sound dispersion in a broad area. The speaker uses top-mounted bass radiator to boost the bass quality. A crossover network is established in the speaker to blend the frequencies of two drivers and produce more detailed audio. For high quality audio delivery, this network includes Mylar capacitors and oversized inductors as crossover components. You can either place it on an elevated top or mount on the wall. Features dual 5-way binding post terminals. 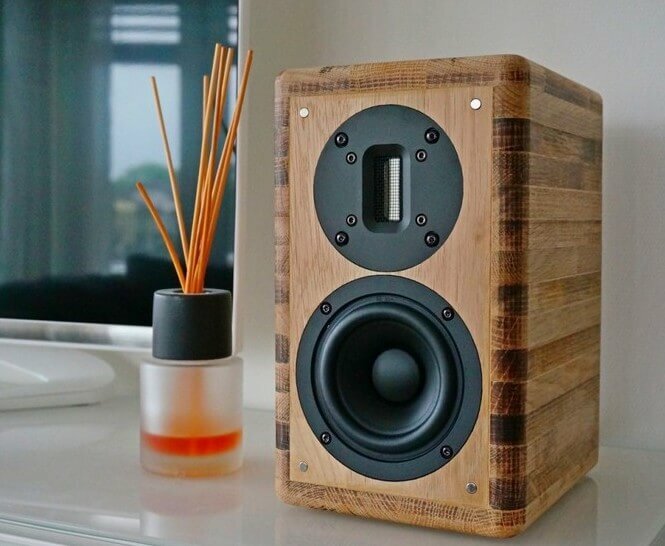 The speaker comes with MDF-graded wood grain enclosure. The enclosure sides are tapered and high-gloss baffles are featured to eliminate diffraction. Removable grille is included. It’s crystal clear from the features, stand-alone or as a part of a system, Definitive Technology SM55 Bookshelf Speaker is always an outstanding choice. Delivers high quality and extended low end notes. The sound dispersion is intelligible and clear even in a large room. The crossover network uses audiophile-grade components for outstanding audio. The speaker is constructed with anti-diffraction baffle and tapered enclosure side for reducing diffraction. You have to make a separate purchase for wall mounting kit. 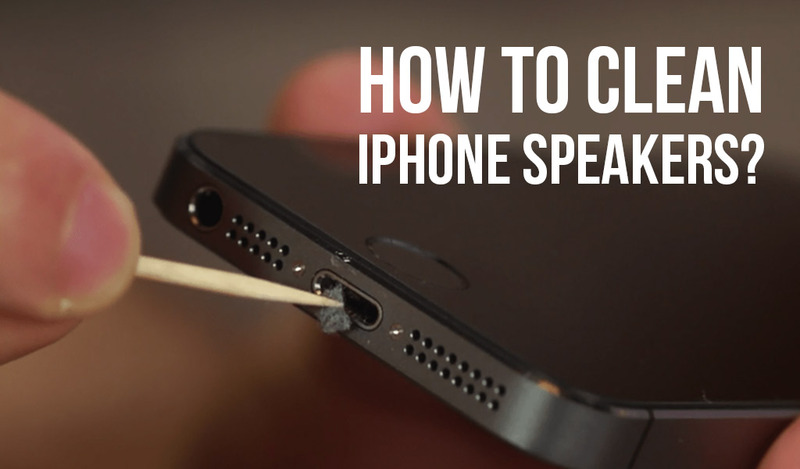 It’s better not to use the speaker without grille because of dust. It can be shipped to a few countries only. Only one Klipsch in a top bookshelf speaker list? I think not. Klipsch RB-51 2-Way Bookshelf Speaker works with 75 watts power handling. It covers a frequency response range of 50Hz-24kHz. Follows 8 ohms impedance and 92 dB sensitivity. This 2-way speaker features a 1-inch titanium Linear Travel Suspension horn-loaded tweeter and a 5.25-inch high-output Cerametallic woofer. The tweeter comes with a tractrix horn that works to create wide dispersion range, while the titanium helps to produce clear treble. The woofer is structured rigidly which gives it splendid damping capacity. Its edge is surrounded by rubber. A crossover network is established inside to block frequencies from going in wrong direction and blend them in a detailed pattern. Klipsch RB-51 2-Way Bookshelf Speaker’s cabinet is constructed with MDF wood. The cabinet has bass reflex enclosure with a single rear-firing port for controlling turbulence noise and vibration. Black ash wood-grain vinyl veneer finish outside fulfills its classy look. Removable magnetic grille is included. The speaker comes with rubber feet for convenient placement on a high place. You can mount it on the wall too, keyhole slots are included. It comes with a pair of standard binding posts that can be connected to most types of connectors and speaker cables. Therefore, you can see, Klipsch RB-51 2-Way Bookshelf Speaker offers a great deal of features for premium audio performance. Is it possible to refuse such excellent deal? 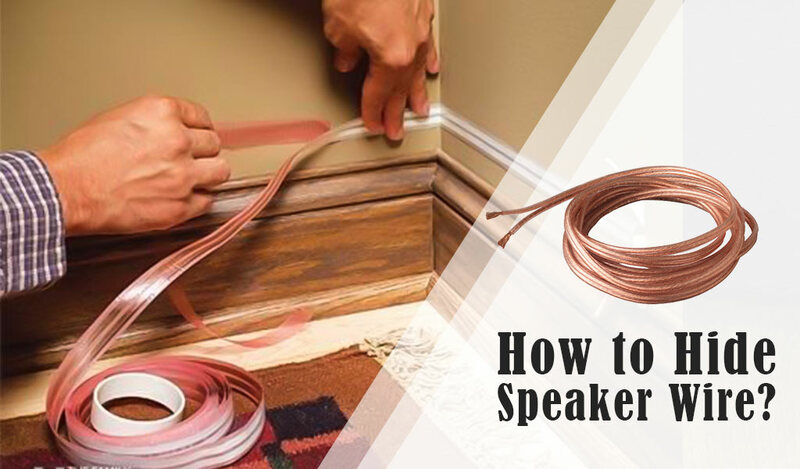 You can use most types of connectors and speaker cables for connection. The crossover network keeps the frequencies original. Comes with several placement options. Doesn’t include a servicing warranty. The mid-range frequency quality needs improvement. Can be shipped to a few countries only. Sounds contradictory, right? Now it won’t be a very stupid question if one asks, why not? If it’s not to be placed in a bookshelf, why it’s named after it? From a general aspect, this question is 100% legit. But if you consider the main reason, not so much. Speakers are constructed differently for several purposes. Sound distribution direction is one of them. If all the speakers were constructed the same way, the sound would always disperse towards one direction only. This one-direction performance wouldn’t be convenient for the listener. That’s why speakers are constructed with several individual patterns. Each pattern is intended for one specific target. Bookshelf speaker’s target is to deliver sound horizontally but on an elevated level, higher than the floor. This target level is kinda equivalent to a shelf top and a ‘bookshelf top’ is an ideal metaphor for that, to describe the best place for the speaker’s placement. This is why it’s named ‘bookshelf speaker’. Anyway, again if we come to the point of audio dispersion, bookshelf speaker is built for delivering sound from any random direction to any other random direction. In short, the sole reason for using this speaker is to get an ambient delivery. When you’re placing the speaker in a bookshelf speaker, some sides are enclosed and the sound can’t disperse from those sides. It affects the speaker’s performance. For full-range dispersion, bookshelf speaker should never be crammed in a bookshelf. A magnetic field is mandatory for sound production. And the performance gets bolder with its size. Bigger the magnet, stronger the performance. But when this magnet is brought near a video device, the result is never good. Video devices don’t react positively to its presence. The magnet can hamper the graphics quality. A bookshelf speaker should never be placed near a video device. However, there are some speakers that feature magnetic shield. Magnetically shielded speakers are safe for those certain devices. Actually, this rule is applicable for almost all speaker types except for those that are meant to be used in certain places like bathroom, kitchen, and spa etc. The internal mechanism of a speaker usually doesn’t react positively to humidity. The maximum presence of water affects the drivers inside the speaker and they fail to response accurately after that. A bookshelf speaker doesn’t usually feature any humidity-resistant characteristics, so you mustn’t place it in a moist area. If your bookshelf speaker is heavy, don’t place it on a lightweight or a shallow base, even if it seems okay. Because the balance can break anytime. The speakers are supposed to be connected to a certain device to play audio files. So, a cable connection is obviously required. Speakers always have ports, posts and terminals for cable connection. However, these ports, posts, terminals vary and so do the cables. There are banana plugs, bare wires, standard wires, pin connectors and many other options available in this regard. Some speakers use RCA and AUX only, some latest and upgraded models include optical or coaxial cables. The connection terminals included in the speaker are built differently for different types of speakers. So, use the suitable one. Use of wrong cable won’t bring you suffrage only, will hamper the terminal as well. Moreover, even if you succeed to insert a wrong connector inside the port; remember, it can result into circuit error or worse, end up damaging the whole system. You have no idea, how bad the consequence can be. If you ever wondered (in case, if you’re new in this market or not an audiophile) what power handling stands for, it’s time to enlighten you with a bit of knowledge. Power handling is a very important unit of measurement for a speaker. It’s measured by wattage. Two things depend on it. Firstly, the number of wattage tells you how much power the speaker is capable of taking. Secondly, it shows you the audio delivery capacity of a speaker at a certain wattage rate or how much power it’s gonna use for a certain volume. Now, here comes the main question, what’s gonna happen when the wattage rate crosses the speaker’s power handling limit. When the wattage crosses the limit, the power goes out of the speaker component’s control. So the drivers inside fail to response correctly and the extended amount of power overheats its parts. In a while, the heat gets intense and the components burn. The burning destroys the speaker, it’s true. But it gets more dangerous when the power directly attacks your stereo system or home circuit. This is the worst of all placement options available for bookshelf speaker. The cabinet is not actually suitable for hanging and this can affect the sound quality as well. Since the bookshelf speaker is not meant for hanging, it doesn’t feature any particular cable, kit or bracket for this purpose. For this reason, when you’re planning on hanging it, you have to come up with a ‘customized’ option of your own. And this is never a good idea, specially when it’s for hanging. Moreover, most bookshelf speakers tend to be heavier. And hanging is never a healthy option for heavy products. You may succeed to cling it for now, but gradually the pressure of gravity and the weight will stretch the cable and hamper it. Yes, not just wire damage, it can result into this as well – not being able to hold onto the cable anymore, the cabinet will fall down and boom! There goes your speaker, to the trash can, since it’s broken in pieces. Bookshelf speakers can be used for many reasons. You can either use it as a stand-alone speaker or as a part of a system. Now, speaking of systems, a bookshelf speaker’s role can be anything here. 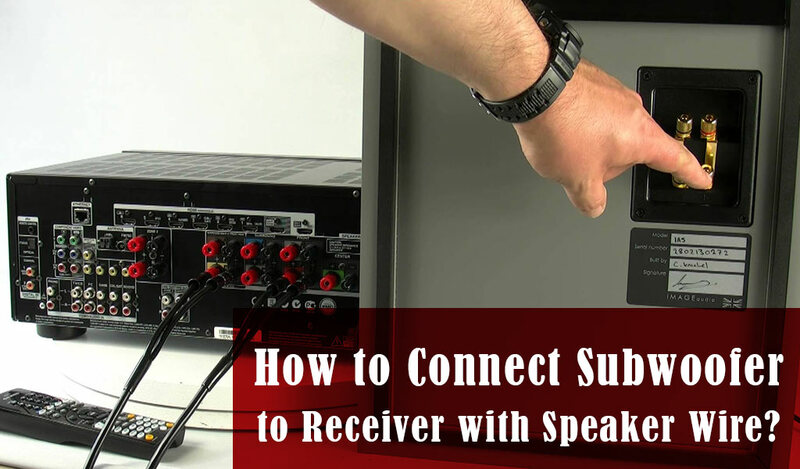 It can be used as a front speaker, rear speaker, center speaker or substitute for a subwoofer. But there are some bookshelf speakers that fail to disperse sound accurately while being in the back. The rear position hampers its capacity or sometimes it’s the speakers in the front that are responsible for its failure. So, if the use is not mentioned, it’s best not to put your bookshelf speaker as a rear speaker. Well, amplifier is used to boost the sound quality. Since many bookshelf speakers (not all) can’t produce enough loud sound alone for a big system, amplifier is required to amplify the notes with higher strength. However, you shouldn’t act “too wise” since we’re dealing with electronics here. We’re saying that because many people have this misconception that amplifier is a must with any speaker. But this is not the case. If amplifier is not recommended, you should not bother at all. 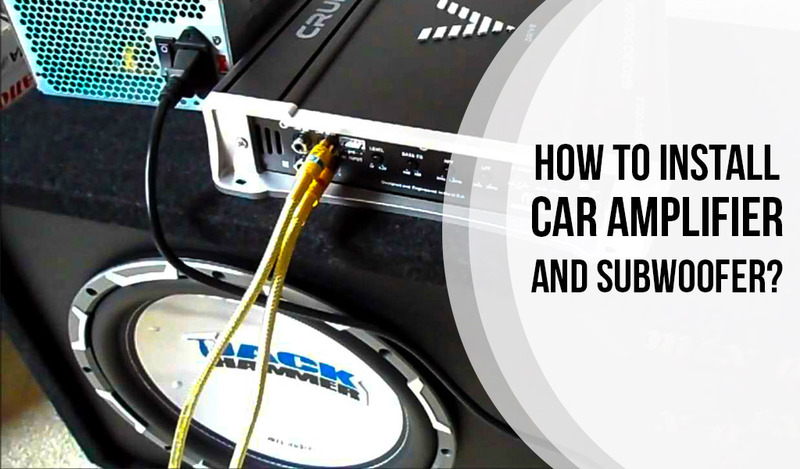 This action will save both your money and the chances of component damaging. 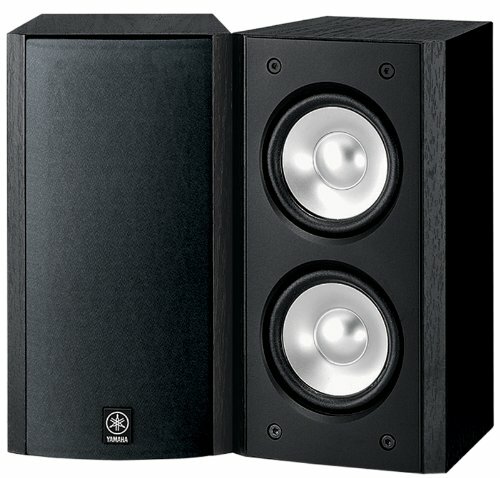 Why bookshelf speakers are called ‘bookshelf speakers’? Because their ideal placement location is an elevated top like the bookshelf rack. Which means it’s supposed to be placed on a shelf or something similar. It’s also the most favorable location for accurate sound dispersion. However, you can mount it in the wall as well if you want to. 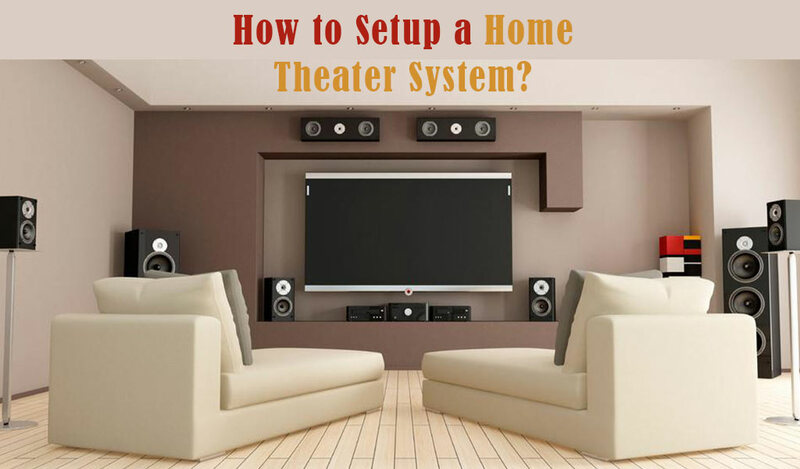 The option is open because sometimes wall mounting is the most convenient option considering the home theater or stereo system setup. Keeping this in mind, some manufacturers do produce such bookshelf speakers that come with apposite features for wall mounting convenience. Some speakers have cables, some include keyhole slots for this reason. For other bookshelf speakers, separate mounting kits or brackets are available in the market. If your speaker doesn’t come with mounting features, you can use these things instead. But, never should you ever, take the matter in your hand. It may sound weird to some people. Sadly, this is not a surprising incident. There are lots of records of the similar act. To mount it on the wall, some people try to do something about it following their rookie instinct. They think drilling can solve the need of kit or bracket. What they don’t understand is, bookshelf speaker has no room for drilling and by attempting such thing, and they damage the speaker instead. So, you mustn’t try to solve the problem on your own by ‘drilling’. Leave it for the professionals and mounting options available in the market. This is a bookshelf speaker, but you can make it a ‘in-wall speaker’ just by mounting on the wall. So why can’t you turn it into a ‘floor speaker’ as well? You CAN turn a bookshelf speaker into a floor speaker, but you SHOULD NOT. If you can’t recall it, we’ve already discussed this matter above for another reason. 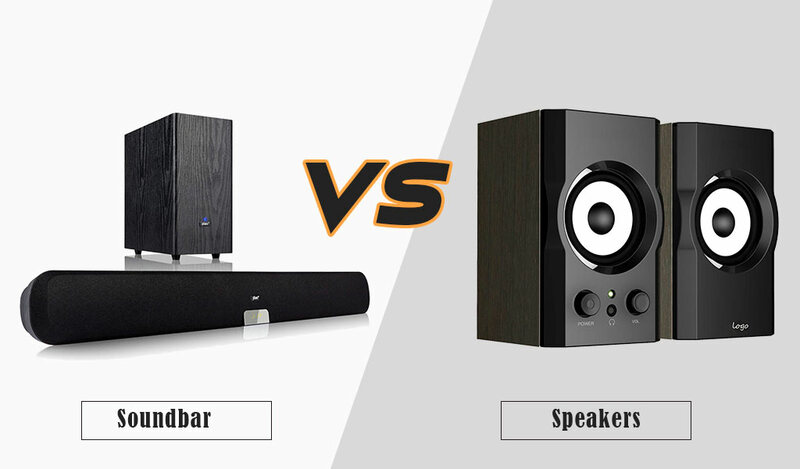 Earlier we said, speakers have several types based on their sound dispersion direction. Exactly. This is why bookshelf speaker is bookshelf speaker, not a friggin’ floor speaker. If you place it on the floor, it won’t be able to disoerse sound like it’s supposed to be. Yup, these are the “DON’T”s that pretty much should not be done if you want the best performance. Some of them are also essential for speaker’s protection. Well now, since you’re done reading these steps, let’s get to the reviews. It seemed like an important duty to make a useful list for you and every other customers like you who are gonna click on this page’s link for the same reason. Therefore we researched and made the list of the best bookshelf speakers under 200 dollars. 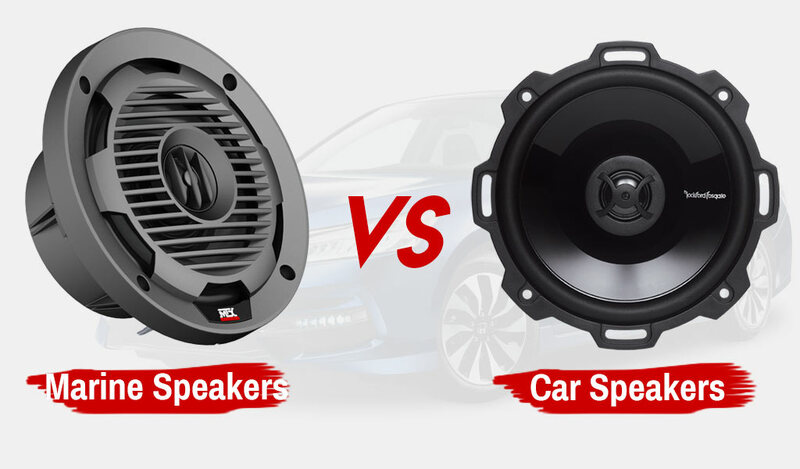 For your utter convenience, we reviewed them thoroughly and mentioned every important specification, so that it becomes easier for you to find a speaker that will suit your need the most. We hope our contribution was beneficial for you and it helped you to get the best item.